This photograph of Belvedere House from the 'Walter Hawkins Nightingale (PWD) collection: Album of views of Calcutta, was taken by an unknown photographer in the late 1870s. 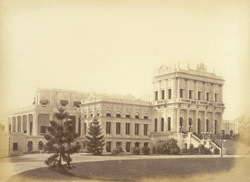 Located in the southern suburb of Alipore, Belvedere was used as Warren Hastings' country house. Warren Hastings was appointed the Governor General of India in 1773. In 1854 Belvedere became the official residence for the Lieutenant-Governors of Bengal. Today it houses the National Library.